The society’s life begins with the date it was formed and registered and shall continue to exist except when the conditions stipulated provisions in Article XV applies. SAA is a non- government, non-profit making, civic and community oriented organization, given to the overall promotion of the continent, with the overall goal of mitigating the impact of HIV/AIDS, TB and Malaria in the African continent, through various activities. SAA shall provide leadership in all AIDS related activities in the African continent and shall promote the activities of other African organizations, through collaboration, and inclusion. 4.1. The SAA Permanent secretariat is located in Accra- Ghana. However The SAA Permanent Secretariat can be relocated for a good reason in any country within Africa, after a resolution by the executive council of SAA. Such resolution should be submitted to the General Assembly of SAA membership for ratification. The ideal staffing for a functional secretariat will be determined by the council from time to time. The core staff will be made up of A bilingual Administrative Secretary, Finance Manager, Planning/Developmental Officer and other supporting staff. 4.1. SAA – REGIONAL AND NATIONAL BRANCHES. SAA regional and National Branches will be established in various countries of Africa. These national branches will have secretariat which will be controlled at the national level, but with close ties with the SAA Secretariat. 5.1. To contribute to the control and management of HIV infection and AIDS TB and Malaria throughout the continent of Africa and to serve as a forum for the exchange of information on HIV/AIDS, TB and Malaria in collaboration with the World Health Organization (WHO) theUNAIDS and others , International AIDS Society, and other International and national organizations on AIDS..
5.2. To serve as an African focus and coordinator of AIDS activities. 5.3. To promote research and training on HIV / AIDS prevention, care in Africa. 5.4. To work hand in hand with African States to mitigate the impact of HIV/AIDS, TB and Malaria in the African Continent. 5.5. To organize International Conferences on HIV/AIDS –STIs,TB and Malaria in Africa and collaborate with other organizations in organizing subspecialty conferences on HIV Infection and AIDS in Africa. 5.6. To solicit, receive, manage and account for funds for supporting the SAA activities against HIV/AIDS, TB and Malaria in Africa. 5.7. To serve as a central registry of individuals and organizations, professionally involved in AIDS research and activities to prevent the spread of AIDS and care for people living with HIV/AIDS, TB and Malaria in Africa. 5.8. To represent the African Scientific community as a voice of reason in AIDS controversies, Speak and act against discrimination/stigmatization, and ensure the observance of ethical norms in all aspect of research and trials relating to HIV/AIDS in Africa. Societies, (national, International) organizations, corporate bodies, having similar objectives, vision and purpose can apply to be affiliated members of SAA. Application for affiliated membership should be completed with membership list, objectives and activities of the applicant. Such application will be considered and approved by a majority of the Governing Council. Affiliated status can be withdrawn for good reasons by a majority decision of the governing council. Any affiliated member may resign its membership anytime. Persons engaged in activities related to HIV and AIDS may become Individual members of the SAA upon acceptance of such application by the executive council and payment of membership dues. Application for membership shall be made on the appropriate form to the secretariat of SAA. Individual membership is tied to the payment of yearly membership dues. Individual membership may be withdrawn for good reasons as determined by the majority decision of the Executive Council such decision would be reported to the General Assemble meeting that follows such a withdrawal. Individual members may withdraw their membership at any time. Honorary membership of the SAA will be conferred on individuals who are known to have contributed to the fight against HIV/AIDS in the African continent. Confirmation of honorary membership is considered as a great honor and numbers will be kept to a minimum number. Any member of the SAA can make recommendation for honorary nomination to the Executive Council of SAA, which in turn will screen such nominations and make recommendations to the Governing Council. A final decision to confer an honorary membership will be made by a majority of 4/5 of the Governing council. The General Assemble will ratify such nomination at the next immediate GA meeting. 7.1. Annual Membership fee for SAA is USD25. Dues and other levies for individual and affiliate membership shall be reviewed from time to time by the Governing Council. Annual dues shall be due on the first day of January of each year. · Membership shall be suspended when dues remain unpaid for 3 months. Membership will be terminated if such dues shall not have been paid within a period of 12 months. Suspension of a member shall be lifted as soon as all outstanding dues and levies are paid. 7.2. Notice will be given in the event of any intends termination of membership for non-payment of dues. 7.3. Dues shall be paid in US dollars or in the equivalent of the currency of the headquarters nation. 7.4. The dues shall be used to finance the running of the Society a well as the operations and activities, which have been approved by the Administrative Council. 7.5. A Financial report of the Society covering the past two financial years shall be given at the annual general meeting of the Society. 7.6. The Society is empowered to raise funds from external sources to help support the functions and activities of the Society. 8.2. Membership may also be terminated for good reasons on recommendation of the Executive Council and approval by the Administrative Council. Prior to this, the member will be informed of the intention to terminate his membership and be given an opportunity to defend him/herself, the reasons on which his/her termination of membership had been based. 8.3. A member may resign from membership of the Society. Such resignation shall be in writing to the Administrative Secretary and may only be effective at the end of a calendar year. 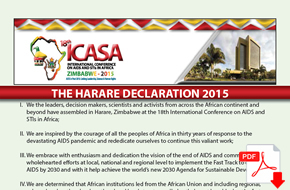 9. INTERNATIONAL CONFERENCES ON HIV/AIDS AND STIs IN AFRICA (ICASA) AND OTHER REGIONAL CONFERENCES. 9.2. 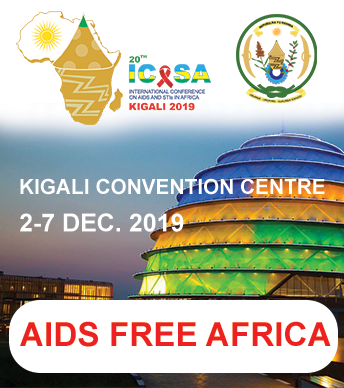 ICASA will be organized in collaboration with other regional, continental and International organizations and other such bodies active in the area of HIV/AIDS. 9.3. ICASA will be held at a frequency of every two years or at any other intervals decided upon by the Administrative council. 9.4. Countries wishing to host the ICASA shall make their intention known – at least 2 years ahead of the ICASA meeting to the Administrative Council, stating its intent, capability and proposals to host ICASA. The Administration Council shall decide through a majority vote on the country to host the following ICASA and announce such decision during the last ICASA meeting. 9.5. The country hosting ICASA shall work in tandem with the Administrative Council through the SAA Secretariat in all the preparation and execution of the programming, scientific content of ICASA. This includes, programmer’s scientific content, fund raising, budgeting scholarship etc. 9.6. The Administrative Council shall appoint membership of the International Steering and Scientific Committees which shall be made up of eminent African and selected international scientist, and organizations representatives of key Institutions working in the area of HIV/AIDS. 9.7. The ICASA hosting country shall be responsible for the appointment of other local committees for ICASA. 9. 8. The hosting country in collaboration with SAA shall take the lead in fund raising fund for ICASA. 9.9. Each nation hosting the International Conference on behalf of SAA shall sign an MOU with the SAA for the right to host the ICASA. The MOU will deal with cost sharing rules for the organization of the conference, programmatic content of the conference structure of conference organ. 9.10. The hosting country shall submit an audited account of expenditure to the SAA executive council at least 6 months after the ICASA. Such account will be widely distributed to all stakeholders (funding agencies) at least 6 months after ICASA had been held. 9.11. After all expenses in respect of hosting the ICASA had been settled, an agreed percentage of unspent fund shall be paid to the SAA account and such fund will be used to fund other activities of the SAA. In addition a percentage of this unspent fund will be set aside by SAA to support the next hosting country. Elections shall be carried out in such a way that only two representative from the central Africa and Northern Africa and three from each of the other 3 regions shall be elected every four years. OR. Only two representatives for each region shall be elected every four years. One (1) member,from the international community who shall be nominated by the thirteen (13) Council members. I . The members of the Administrative Council shall be elected for a term of four years. They shall be eligible for reelection for a further term of four years. However, elections shall be carried out in such a manner that only two (2) representatives from the Region and three (3) from each of the other three regions shall be elected every four years. ii. Not less than two months before the expiration of term of office of the Administrative Council, members of the Council from each region shall meet separately and nominate at least three candidates to contest the vacancy or vacancies left by the retiring regional representatives, giving consideration to the need for geographic representation within that regional representative by ballot election. The newly elected members should be announced at the annual meeting. iii. In the absence of due process of nomination from a region, the Administrative council will select representatives at its annual meeting. iv. Vacancies on the Administrative Council shall be filled by member(s) appointed by the appropriate regional representatives and accepted by the Council. The term of office of members elected in this way shall end at the time of the term of the replaced member would normally expire. The Administrative Council shall elect from among its members an Executive Council comprising of a President, the Vice President, the Treasurer, the deputy treasurer, Secretary General and deputy secretary general. If election or re-election to office of Executive Council extends beyond the member’s term on the Administrative Council, another member shall be elected to the Administrative Council, from the region in question to maintain the four year rotation. The Executive Council shall be responsible for executing the decision made by the Administrative Council at the biennale meeting. The executive council shall be empowered to take decisions on behalf of the Administrative council, in case of emergency the President in consultation with members of the council will take appropriate decisions for the well-being of the Society. The President shall preside over the Executive Council. The President shall represent the Society. His duties shall include presiding over all meetings of the Executive Council, the Administrative Council and the General Assembly, calling extraordinary meetings as necessary; appointing members of committee; and presenting honors and award. The President shall have the power to take all urgent action between the general meetings, such as ordering of special expenses, which are not included in the budget approved by the Administrative Council. Support the fund risingstrategy of the Society. He or she will be the President of ICASA during his tenure. (iii) THESECRETARY GENERAL: Responsible of all scientific program of the Society, liaise with Africa scientist community as well as international scientist, shall act as a liaison with all scientific journal. Be the voice of the society in terms of scientific activities and orientation. Supervise all SAA publication; support the fund rising strategy of the society. He/ SHE shall fulfill all other responsibilities as required by the president. (iv) DEPUTY SECRETARY GENERAL: HE/SHE shall fulfill all responsibilities as required of the SG. Should the SG be incapacitated or his office be vacated, the DPSG shall be designated as SG until the end of the term of office. He shall fulfill all other responsibilities as required by the Secretary General. Support the fund rising strategy of the society. (vi) THEDEPUTY TREASURER, HE/SHE shall fulfill all responsibilities as required of the treasurer. Should the Treasurer be incapacitated or his office be vacated, the DT shall be designated as T until the end of the term of office. He shall fulfill all other responsibilities as required of the Treasurer. Support the fund rising strategy of the society. (vii) SAA Administrative Secretary/ Coordinator: shall be the head of the Secretariat at SAA Secretariat. He/ SHE shall reside in the country where the headquarters of the Society is for the time being located. The term of office shall be four years and is renewable open availability of found. The Administrative secretary shall be the link between ICASA host countries and the Administrative Council. The Administrative Secretariat shall maintain liaison with national and regional SAA societies, committees etc; Shall handle correspondence; shall maintain files; shall prepare and circulate the official minutes of meetings of the Administrative Council and the Executive Council and the SAA Newsletter; shall preserve the signed and attested originals of such documents; shall prepare and circulate agenda for meetings of the Administrative and Executive Council; shall receive and process applications for membership in the society; shall receive and tabulate votes in all elections; and shall fulfill any other duties so defined by the President. In addition, the Administrative Secretariat shall develop strategies for SAA activities and funding, e.g. for training programmes, meeting and events. (viii) With the exception of the Administrative Secretary/ Coordinator, members of the Administrative Council, Executive Council, and officials of other committees cannot receive remuneration of any kind for their services to the Society. Only the Administrative Secretary/ Coordinator who is a full time employee of SAA will receive a reasonable remuneration for his work. Travel and other reasonable allowances may be provided to the Administrative Council and Executive Council members for officially sanctioned business and meetings; however, funds to pay for these activities cannot be derived from general membership dues. 12.1. Standing Committees and any necessary ad hoc committees shall consist of an uneven number of active members appointed by the President as approved by the Administrative Council. Members shall serve on a committee for a term not exceeding one year but shall be eligible for reappointment for additional consecutive terms of one year each. 12.2. The terms of reference for each committee shall be defined by the Chairman and committee activities shall be subject to review by the Executive Council. 12.3. Each region shall form subcommittees to fulfill the interest and needs of the region. These subcommittees shall be administered sub regionally. 13.1. All land, buildings and other immovable property and all investments and securities which shall be acquired by the Society shall be vested in the names of not less than three trustees who shall be members of the Society and shall be appointed at biennal general meeting for a period of four years. On retirement such trustees shall be eligible for re-election. A general meeting shall have the power to remove any of the trustees in case of death. Vacant position shall be filled at the same or next general meeting. 13.2. The trustees shall pay all income received from property vested in the trustees to the treasurer. Any expenditure in respect of such property, which in the opinion of the trustees is necessary or desirable, shall be reported by the trustees to the executive committee, which shall authorize expenditure of such moneys as it thinks fit. The society shall be registered as a non-governmental, non-profit making organization in the country that serves as its headquarters. 14.1. A list of rules and procedures may be drawn up by the Executive Council and the approved at the general meeting. The rules and procedures are intended to lay down various matters not provided for in this Constitution and in particular, matters relating to the internal administration of the Society. 15.1 Written notification must be mailed to Society members in good standing at least two months before a regular or an extraordinary general meeting of the Society. Amendments to this constitution may be made by a majority of the members present at a regular or extraordinary general meeting of the Society. 16.1. Liquidation of the Society shall require a resolution to be passed at a regular or extraordinary general meeting. Such a resolution shall be placed before it by the Chairman after prior approval by the Administrative Council. The Administrative council shall appoint one or several liquidators; any balance remaining after payment of all or several non-profit organization or organizations recognized as being of public benefit and having similar objects to the Society as shall be determined by the Executive Council. Provided, however, that no liquidation of the Society shall be effected without the prior permission in writing of the Registrar of Societies, abstained upon application to him signed by three of the office bearers of the Society. 17.1. The books of account and all documents relating thereto and list of members of the Society shall be available for inspection at the registered office of the Society by any officer or member of the Society on giving not less than seven days notice in writing of the Society. An auditor shall be appointed for the following year by the Executive Council. The auditor shall examine all such accounts and all statements relating thereto and either certify that they are correct, duly vouched and in accordance with the law or report to the Society in what respect they are found to be incorrect, untouched or not in accordance with the law. The remuneration of the auditor shall be fixed by the Executive Council. No auditor shall be an office bearer or a member of the Executive Council.